CALL TO ACTION: SUPPORT TEMPORARY PROTECTED STATUS FOR MALI! Dear concerned global citizens, get involved and support TEMPORARY PROTECTED STATUS for Mali! 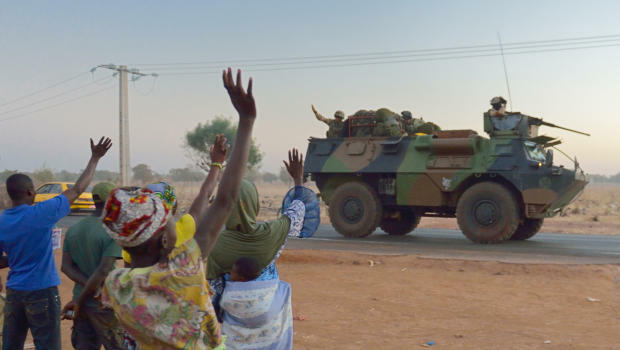 Over the last ten months, the situation in northern Mali has escalated, with the resignation of the Prime Minister and the inability of the government to respond appropriately to the destructive armed insurgency. Over 350,000 people have been displaced and many are unable to meet their basic needs as they struggle to recover from forced evacuations as well as the remnants of a severe drought earlier in 2012. Given the current situation, deporting hundreds of Malians from the United States would only exacerbate this volatile climate and needlessly place people perilous in situations. Temporary protected status (TPS) designation for Mali would protect those Malians in the US that need stability until the violence and conflict in their home country subside. TPS would allow those who are eligible to live, work, and study in the United States until it is safe for them to return home. In addition, TPS would enable Malians to provide support and aid to their families and communities, offering relief to those affected. You can make a difference by calling the Secretary of DHS, Janet Napolitano, at 202-282-8000 or find your local representative by clicking here: find your local representative. You can also send the White House a letter here. Over the past decade, the 700 block of East 79th Street has undergone a transformation that points to another shift in Chicago’s ethnic landscape. First came Yassa, a Senegalese restaurant whose spicy, rich cuisine has garnered attention from foodies across the region. Then Mandela, an African grocery store, opened next door, followed by two hair braiding shops and a Senegalese tailor across the street. Now, the colorful business strip lies at the heart of hopes within one of the city’s fastest-growing immigrant groups for an “African village” that can stake a claim to a neighborhood in the same way that newcomers have shaped pockets of Chicago for generations. “We see this as an anchor around which we can see other community development aspects flourishing and, over time, use it to create our resources and, hopefully, our political power, just like in other communities,” said Alie Kabba, director of the United African Organization, an umbrella group that has been scouting the 79th Street area for property to use as an African community center. Since 1990, the number of Africanimmigrants in the Chicago area has quadrupled to an estimated 42,300, now the country’s fifth-largest African population behind New York, Los Angeles, Washington and Minneapolis, U.S. census figures show. The growth comes as older immigrant groups like the Italians and Irish that once dominated certain city neighborhoods shrink, and as members of larger groups such as Mexicans and Poles move to the suburbs or return to their native lands in search of better opportunities. For decades, African immigrants have been concentrated in North Side neighborhoods such as Uptown and Edgewater, where refugees from Ethiopia, Eritrea and Somalia moved to be close to the many social service agencies based there. While those communities continue to grow, Africans from Senegal, Nigeria, Mali and Ghana have been moving to the South Side, where rents and home pricesare cheaper, community leaders say. Others have been moving to the southwest suburbs. 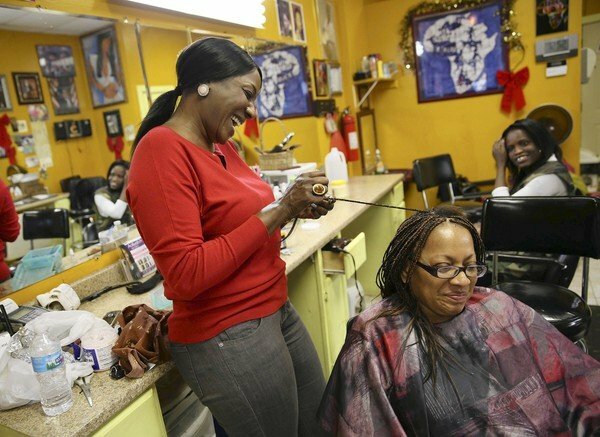 The community’s growth on the South Side can be seen in hair braiding shops that do brisk business among soul food restaurants and sneaker stores in Bronzeville and Chatham or in the clusters of taxicabs parked outside mosques and churches in the shadow of the Chicago Skyway. Sahel Calling is an interactive, musical project to raise awareness about the refugees, internally-displaced persons and the people living in the conflict-affected areas of Mali and the Sahel. The Sahel Calling Project works with guidance from Oxfam, UNHCR and Conscience International. The project is inspired by the musicians in the region who are risking their lives by singing and speaking about the political situation and the violation of human rights. As of October 2012, an estimated 208,000* refugees have fled the north of Mali for other countries due to drought and famine – hardships which were then exacerbated by rebel insurgences which shut down infrastructure and led to a “justice” system that violates human rights. There are also 203,000* “internally-displaced persons”(IDPs) to consider, who have fled but remain in Mali, as well as all of the people still living in the north of Mali under life-threatening risks from drought and famine and limited infrastructure, including the closure of markets, hospitals, banks, etc. There has been destruction of cultural and religious landmarks and manuscripts, and the imposition of human rights violations. Among more atrocious violations is the outlawing of the creation of or enjoyment of music. To find out how YOU can help Sahel Calling, visit their website and donate today! Bill Passes for Driver’s Licenses for ALL Immigrants in Illinois! SPRINGFIELD– On Tuesday, January 8th, 2013, Illinois law makers passed bill SB 957, allowing ALL immigrants in Illinois to obtain a Temporary Visitor’s Driver’s License. The bill passed through the House on a vote of 65-46 and passed through the Senate (41-14-1) in early December. Congratulations to everyone who worked hard in lobbying, and to those in support of this important bill! Thank you for making highways SAFE in Illinois! and don’t forget to visit Highway Safety Coalition for more information! Give Your Fundraising A Boost: Hands-On Grant Writing Workshop! This workshop is an opportunity for hands-on learning and peer exchange around how to make your group’s overall fundraising strategy more diverse and sustainable by fundraising from a broad range of sources, including individual donors, sale of products, special events/benefits, and fee for service. The workshop will provide practical insight on writing successful grant proposals. ~Your income is equal to or less than that listed in the table. CAN-TV April 2013: The Naturalization Process from Alie Kabba on Vimeo. The 7th Annual Return From Exile Program, honoring Cheikh Ahmadou Bamba, will be hosted by the American Murid DAARAH! 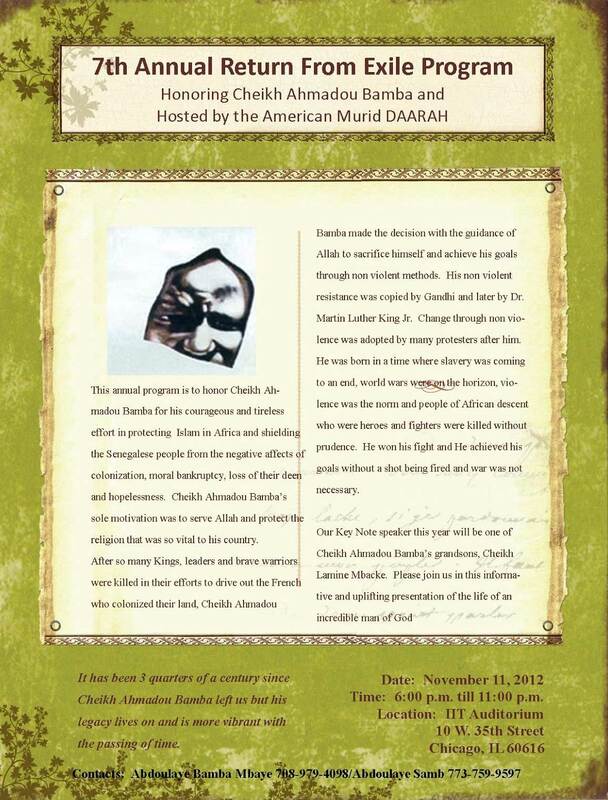 This annual program is to honor Cheikh Ahmadou Bamaba for his courageous and tireless effort in protecting Islam in Africa and shielding the Senegalese people from the negative affects of colonization and moral bankruptcy.